Description: Waking up with a terrible hairdo is not what our princess expected, but now she has to get ready for the big ball! 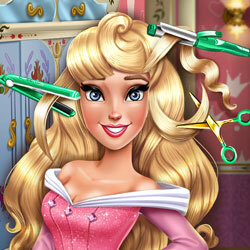 Help Sleeping Princess get a haircut in an enchanted salon where you can dye, cut, curl and even grow back the hair. Once you've designed a perfect hairstyle add glitter or cute accessories and dress her up in an elegant gown.